After years of studying remarkable companies and speaking to some of the most influential leaders, Tim Manners has discovered a solution to the marketing woes of many brands. Stop worrying about demographics, fads, and cutting-edge advertising. Instead focus on relevance. There always appears to be more than enough books on the topic of marketing. Some of them reinforce commonly accepted theories of branding and advertising. Others are soapboxes for authors whose views are intended to shock, amuse or create enough controversy to get noticed. That’s why Relevance: Making Stuff That Matters is a breath of fresh air. Tim Manners, a long-time observer of the marketing wars, starts with the premise that many of the “best practices” of the past 50 years are no longer relevant. He questions the usefulness of demographics, the coolness of buzz and the effectiveness of advertising. Manners focuses his laserbeam observations on what makes brands relevant. Structuring the book into three parts –– problems, solutions and “what success looks like” –– Manners proceeds to pepper the text with case study examples from 87 brands and insights from 50 marketing executives. While the rapid-fire nature of the book can leave your head spinning at times, Relevance is packed with relevant and timely reportage and advice. Manners takes aim at traditional advertising because “it does not help anyone solve any problems or live a happier life.” He points out that such companies as Netflix and Starbucks use word of mouth, sampling, and superior customer service, rather than advertising, to generate customer loyalty and grow their businesses. Advertising, says Manners, is simply an opportunity for marketers to deliver “irrelevant messages.” Instead, he lobbies for marketers to make an investment in their customers’ experiences. That means taking a new look at radio as a conversational rather than an advertising medium. It means inviting customers into a dialogue via blogs and interactive feedback mechanisms. It means basing the products you develop on the insights you gain through your customer base. In addition to insight, Manners discusses several other important aspects of relevance: Innovation, investment, design, experience and value. For each of these cornerstones, Manners presents case studies and quotes from experts. Design is an area that deserves more attention than it is given in most marketing books, and the author doesn’t overlook it. Manners offers a particularly interesting analysis of the color yellow, which, he theorizes, became instantly popular in marketing many brands because of Lance Armstrong’s “LiveStrong” anti-cancer crusade. The yellow LiveStrong bracelet became a campaign symbol worn by millions of people around the world. In a final section entitled “Relevant Outcomes,” the author suggests that growth is a by-product of relevance, because relevant brands “like their customers and understand them well enough to predict what they want.” Manners uses salient quotes from executives at such companies as Patagonia, GlaxoSmithKline and Dunkin’ Donuts to hammer home his argument. The choice of companies is intentionally diverse in order to make clear that relevance is universally applicable. Manners also cites several old-line companies that follow growth strategies. Relevance is a compact book, divided into short bursts of information that will make it easy for a busy executive to read it in digestible chunks. The concluding bulleted list of “Certain Secrets of Relevant Brands” provides a distilled summary of the main points covered in the book. 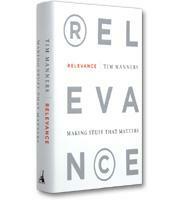 Relevance is likely to be a very relevant read for anyone responsible for marketing a product or service.